The easy answer to this post title is; have me as a friend. In fact that’s the answer to most ‘how to have an amazing [insert ‘thing’ here – birthday/wedding/party/life]’ questions but as some of you may not have the pleasure of knowing me in real life (life away from a computer screen – yes, that life does exist) then I shall expand. You may remember a post from way back, when one of my besties was getting married – Her 6 amazing bridesmaids decided to throw her the mother of all hen-dos in London – sound familiar, no? Then read up here (yeah, link back!). Well these 6 bridesmaids realised that duty did not end once the bouquet had been thrown. No, no, no. Once bouquet had wilted into a forgotten memory a bump started to appear and we knew that once again with great power would come great responsibility and thus wheels were put in motion for the Baby Shower of the year. 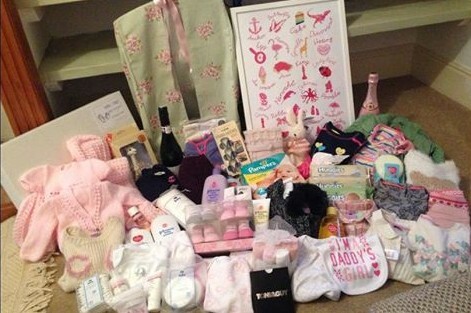 Now my friend is extremely lucky, one, because she has so very many, lovely friends who’ll happily surprise her with a baby shower and, two, because she is one of the first out of them to have a baby. By the time I get round to doing the baby thing I’ve a feeling showers will be so passée! Or everyone will have been to so many that they’ll do anything to avoid another one. But I digress. My point is that this was in fact my very first baby shower as well as the mum-to-be’s. So I’ll be honest I didn’t really know what I was doing. Luckily I had 5 other girls to whip me into shape and between us we sorted the decorating, the games, the presents and the food. Each being allocated one area to out-do the other on. (Cue lots of – you will rue the day you put me in charge of cups and ice!!!! – quotebacks) I handily nominated myself to bake my burger cupcakes for the occasion, particularly because I know my friend l.o.v.e.s. burgers so cake versions would surely make a mum-to-be very happy – and with this nomination, I pretty much alleviated myself from all other duties. Nice. Work. Harriet. With it being a surprise we were, naturally, running late on the day and there were some suspicious diversion tactics but it seems we got away with it and my glowing friend was utterly, utterly shocked when she walked into her house and found us all stood there! Amazing. Once the “but you said you were in Derby this weekend” exclamations ended we poured some alcoholic and non-alcoholic drinks and sat the now crying (goal achieved!) soon-to-be-Mama down, ready to work her way through the mountain of presents. There was lots of ahhing and “cuuuuuute!” outbursts, we really did nail the classic baby shower spirit. Once the presents were opened we moved on the game – everyone having bought a picture of themselves as a baby we had to guess who was who. It was actually really funny. Some were really obvious while some were impossible. One friend, literally guessed the same person for all of them which was the best bit. Food was devoured, Shloer was slung and it wasn’t nearly as painful as I’d imagined a baby shower to be! I’m kidding! 1. Know your audience, some mamas want pink for their girl, some don’t. Make sure you abide by this colour preference. 2. Games are good! But not too many. At first I thought games were totally unnecessary but ours filled in a little time and gave the shower a bit more length and purpose. You don’t need loads of games and keep them fun, I think measuring the bump for instance has the issue of making mum feel that she’s huge. Games or not though, you get enough women in a room together and they’ll find stuff to talk about, awkward silences isn’t really something that females do. 3. Food. People pretend to come for the event, what everyone really comes for is the food – particularly an amazing chocolate cake. Which I could probably have eaten Bruce Bogtrotter style, to myself. My burger cupcakes also went down a treat as the looked really kitsch. Copy the recipe here and, honestly, pass them off as your own idea! Aren’t you clever! 4. Take time to talk to the lady of the moment. Soon she will have a child. A completely dependent, screaming, sleeping, shitting, sucking baby, that will take up all of her time – for the first few months at least. So make the most of having a good old catch up with her before someone else’s toilet habits become more important that your latest bargain purchase from Topshop. 5. For the present. Try and find out before hand whether there’s anything your friend needs. If it’s a first time mum she’ll probably have a lot of stuff already that she bought in excitement when she found out she was pregnant. Everyone tends to buy clothes so think of something a bit more useful of fun. I went for Sophie the Giraffe or should I say Sophie la Girafe which is (apparently) the must have toy at the moment for new-mums. Failing that, get something for her that she can use when the pregnancy is over. We all clubbed together and got her a voucher to get her hur did, as we knew how much she wanted to do this as soon as the baby was born. A bottle of champers won’t go a miss either. She’ll also probably forget to drink it in all the post-pregnancy madness (ah baby brain!) so remember to drop round and remind her she’s got it too…then help her drink it. 6. A surprise really works! If it’s possible it’s a great idea as the mum really does feel even more special! I had a really lovely time at the baby shower – and broody I am not. It was lovely to be able to give her a bit of a lift in the last month of her pregnancy. Take her mind of the swollen ankles, the sleepless nights, the giant football on her front and say, ‘you’re going to do great’. It was also amazing to remind her how many people she has around her that will be there to help when the little baby finally arrives. For more amazing baby shower ideas I recommend heading over to pinterest. There are some next-level ideas on there, y’know if you really want the others at the shower to rue the day.